Electronics enthusiasts, developers and makers may be interested in the new micro controller added to the ever-growing range of electronic components from the Adafruit store, with the arrival of the Pycom GPy WiFi, Bluetooth LE And LTE-M which is now available to purchase priced at $55. 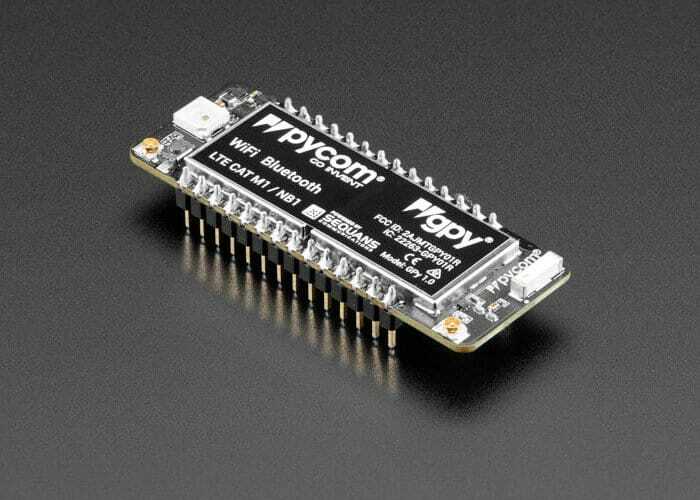 The Pycom GPy is a triple-bearer MicroPython enabled micro controller offering enterprise grade hardware for Internet of Things platforms or connected projects. Offering three networks in one tiny device and the same small form factor footprint as the WiPy-LoPy-FiPy-and-SiPy, IoT development boards. The GPy offers connectivity via WiFi, Bluetooth LE and dual LTE-M (CAT M1 and NBIoT) making it a versatile micro controller which can be used on a variety of different projects whether you need free medium range connectivity or longer range connectivity. Although you will need an antenna for LTE usage available to purchase separately directly from the Adafruit online store priced at $12. The GPy has a built-in operating system that supports MicroPython, the lightweight cousin of the Python programming language and offers a great all-in-one board for flexibility during testing, install, deployment and even real-time airtime network roll-out. For more details and full specifications jump over to the official Adafruit store by following the link below.